Egyptian hieroglyphic ideograms are formed in accordance with natural laws. 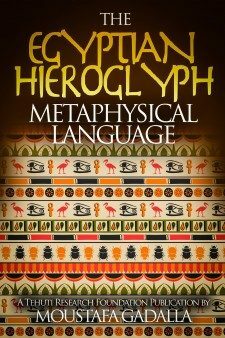 The character of the Egyptian written sign inheres in this natural capacity to recreate processes. 1. Pictures, or actual representations of objects. To copy is merely to reflect something already there, inert. Through imitation, we enlarge nature itself and become nature; or we discover in ourselves nature’s active part. 2. Pictorial symbols, which are used to suggest abstract ideas. Imitation through imagination means creating art objects to be set beside the natural objects of the world. The method of artistic creation and the shape of the object created are specifically human realizations of the universal creative forces present in nature. It is the force of the imagination through which we can feel ourselves related, sympathetically, to the larger “latent” force of the cosmos. In creating new objects with the aid of the imagination, the mystic does not desert reality by constructing things alien and unnatural. Imagination does not tamper with the world, but moves it in accordance with nature. A symbol, by definition, is not what it represents, but what it stands for; what it suggests. A symbol reveals to the mind a reality other than itself. Words convey information; symbols evoke understanding. A chosen symbol represents that function or principle on all levels simultaneously—from the simplest, most obvious physical manifestation of that function to the most abstract and metaphysical. Without recognizing the simple fact about the intent of symbolism, we will continue to be ignorant of the wealth of Egyptian knowledge and wisdom. This symbolic language represents a wealth of physical, physiological, psychological, and spiritual data in the symbols/signs. Many phrases are being used throughout the world which consistently state that the human being is made in the image of God – i.e., a miniature universe – and that to understand the universe is to understand oneself, and vice versa. Yet, no culture has ever practiced these principle like the Ancient Egyptians. Central to their complete understanding of the universe was the knowledge that man was made in the image of God and, as such, man represented the image of all creation. Consistent with such thinking, a depicted human being represents both the universe as a whole as well as the human being, on Earth. The difference between the two will be clear in the context of the text. Egyptians’ careful observation and profound knowledge of the natural world enabled them to identify certain animals with specific qualities that could symbolize certain divine functions and principles in a particularly pure and striking fashion. When we talk about loyalty, there is no better way to express loyalty than by a dog. When we talk about the protective aspect of motherhood, there is no better way to express it than with a lioness. This symbolic expression of deep-spiritual understanding was presented in three main forms. The first and second are animal-headed humans, or a pure animal form. The third form is the opposite of the animal-headed human. In this case, we have a human-headed bird—such as the Ba—representing the body soul hovering over the body. The depiction of the Ba, then, is the divine aspect of the terrestrial. In Egyptian symbolism, the precise role of the neteru (gods/goddesses) are revealed in many ways: by dress, headdress, crown, feather, animal, plant, color, position, size, gesture, sacred object (flail, scepter, staff, ankh), etc. This symbolic language represents a wealth of physical, physiological, psychological, and spiritual data in the presented symbols. Practically all figures on the walls of Egyptian monuments are in profile form, indicative of action and interaction between the various symbolic figures. A wide variety of actions in the forms are evident. One must view these depictions in the proper perspective (how does this series of depictions relate to each other? ), but first, how do these depictions fit in the overall picture (in the context of the text)? Hieroglyphic characters may be written in columns or in horizontal lines, which are sometimes to be read from left to right and sometimes from right to left. There was no fixed rule about the direction in which the characters should be written, but the heads always turned towards the beginning of the sentence. The orientation of the characters could be affected by a multitude of factors, such as the type of material written on, the position of the text in relation to figures or other texts, or the nature of the inscription. In certain cases, texts were deliberately written backwards. There are also examples of inscriptions that make sense only when read from bottom to top! b. A single symbol in double or triple form to reflect duality or plurality. d. A cluster/group of separated 2-3 images showing a loose connectivity of specific thought/concept in a dual or triple structure.